Abt No.1 is seen approaching the turntable at Dubbil Barril on 6 May 2003, while being prepared to tackle the 1:20 gradient rack section to Rinadeena. This locomotive was built by Dubs and Co, Glasgow in 1896 as their builder's number 3369 (a) and was the first of the Abt-rack locomotives of the Mt Lyell Mining & Railway Co. The railways of Tasmania's west coast are one of the most interesting chapters in Australia's railway history as competing companies raced to win dominance over the mining riches of the area. The railway built by the Mt Lyell Mining & Railway Company was one such daring venture as investor funds and the company's fortunes were committed to a rack railway connecting Queenstown to the docks at Strahan. The route crossed difficult mountain country using the Abt-rack system, and indeed the route was largely complete before locomotive Abt No.1 arrived from Glasgow. It was assembled in the bush at the "Camp Spur" work camp alongside the newly-laid rack railway, and fortunately proved successful during testing! Abt No1 and its sister locomotives settled in to a life of hauling copper concentrates, mine supplies and general traffic over the My Lyell railway, supported by conventional locomotives on the non-rack sections of the route. The five Abt locos were originally coal burners but were converted to oil firing late in their working lives. 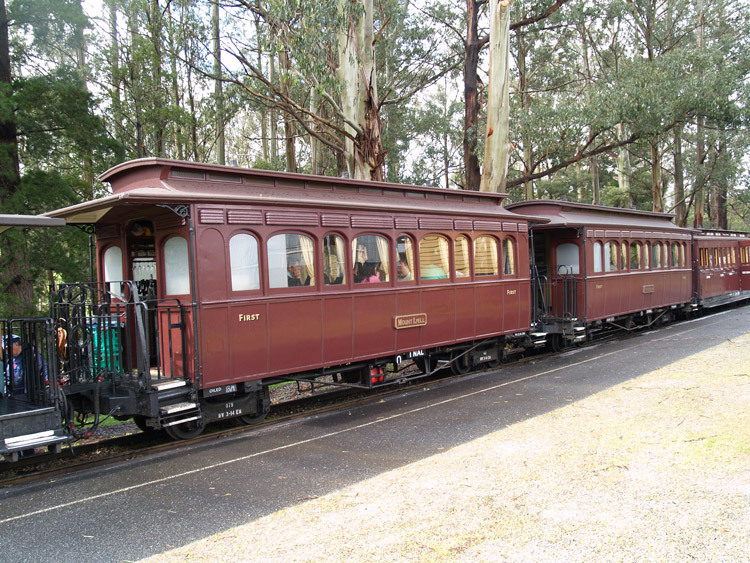 The Mt Lyell Railway was closed in 1963 and subsequently dismantled, but fortunately several of the locomotives and carriages passed into preservation. 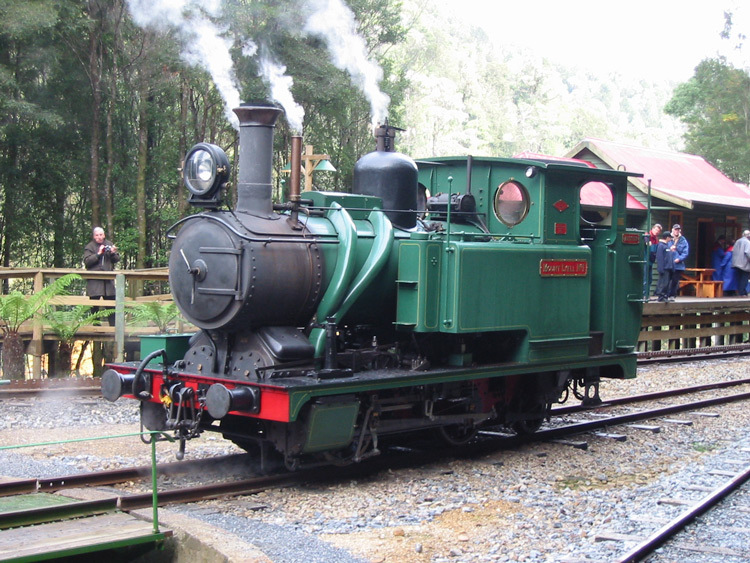 Abt No.1 was donated to the West Coast Pioneers Museum, Zeehan and was displayed for many years alongside their other railway exhibits. The old My Lyell railway fell into disrepair, with many of the timber trestle bridges rotting in the wet west coast climate, and the major bridge across the Queen River swept away in floods. The route was overgrown and impassable in places when the webmaster attempted to bushwalk it back in 1993! Abt No.1 treated the webmaster to a great day on the West Coast Wilderness Railway on 6 May 2003; the photos on this page were taken on that day. 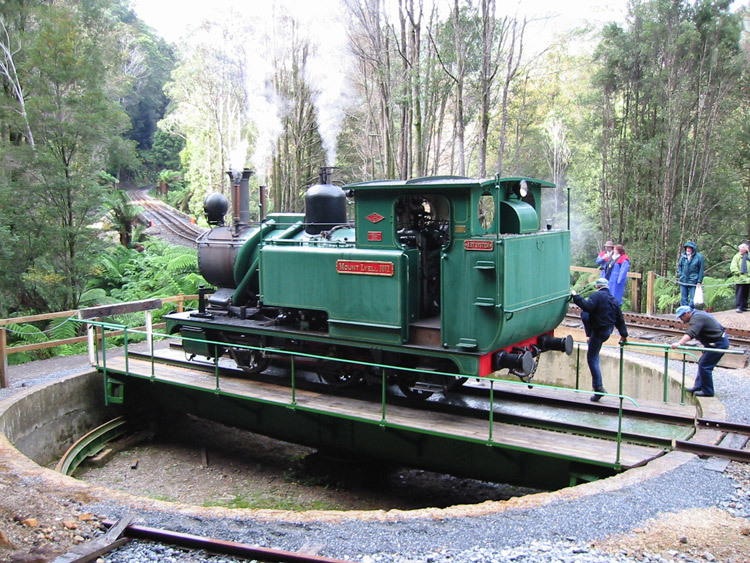 I thoroughly recommend a visit to the West Coast Wilderness Railway for anyone interested in ferroequinology - or wanting to sample the history and beauty of Tasmania's West Coast region! Lou Rae has written a number of excellent books on the railways of Tasmania's West Coast, including "The Abt Railway & Railways of the Lyell region" (a) which gives an excellent account of the building and operations of the Mt Lyell Mining & Railway Company, together with competing interests. The Queensland Government Railways also operated an Abt rack route and one interesting relic survives. Abt No.1 approaches the turntable at Dubbil Barril on 6 May 2003. It carries ornate "Mount Lyell No1" name plates on the side tanks. Abt No.1 rides the turntable at Dubbil Barril on 6 May 2003. The rack railway can be seen climbing in the background. and were converted to 2' 6" gauge. 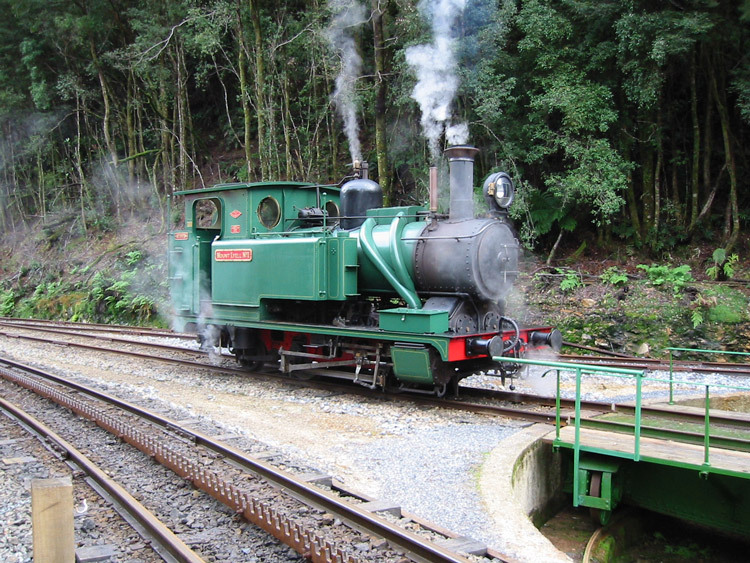 They have since given many years of service on the Puffing Billy Railway. Two of these carriages are seen at Menzies Creek on 13 October 2013.
b L. Rae, 'The Abt Railway & Railways of the Lyell region', published by Lou Rae, PO Box 508, Sandy Bay, Tasmania, 7006.